Sometimes it is not always possible to find out something by reading books, no matter how good they are. Probably the best way to increase your skills is using the experience of other mosaicists. In these Q & A pages are problems posed over the years by our readers. As you can see, they cover a wide variety of topics. If you have a problem or a technical query, have a look at the pages carefully, as someone might have answered your question already. If there is a question that has no answer posted against it, try e-mailing the person to see if they have had a reply. 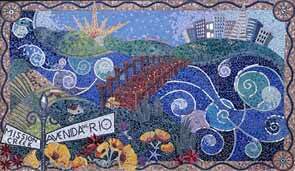 The mural above is located in San Francisco CA, designed and executed by Lillian Sizemore and Laurel True for the Mission Creek Bike Path Project. The mural is made of 120 different tile colors and mirror, all hand-nipped. It measures 15 ft. x 8.5 ft. Mayor Willie Brown of San Francisco attended the "unveiling" ceremony! But if you don't find what you're looking for in the Q & A pages we have another way for you to find an answer to your question - our own forum. Existing questions and replies will remain on the site for future reference.